San Diego producer Emerson Windy found much success working behind the scenes for big mainstream acts like Snoop Dogg, Three 6 Mafia, Crooked I, WC and more! 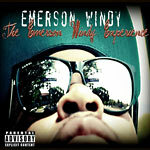 Now he's stepping out from behind the boards and emerges as a rapper with big dreams of his own on the Emerson Windy Experience. There are both commercial styles as well as more traditional hip hop based tracks like ''Mr. Weedman.'' Think of a more energetic and upbeat Devin The Dude or Curren$Y. I have not enjoyed a CD purchase this much in a long time... Great album front to back. Emerson Windy is going straight to the top. Never ceases to Amaze me, sounds out of Diego are always on the forefront and cutting edge of Hip- Hop! This album is no less amazing! Innovative, different, and ROCKIN'! If you haven't copped it, you better, you don't want to miss out! OK, so my friends told me about a Scratch-N-Sniff Weed CD at Access and I went to buy it for that, cuz I thought it was so funny. THE ALBUM IS SO GOOD!!! I didn't know what to expect, but I was really impressed - everything is catchy and lyrics are clever & hilarious. LOVE THIS! HIGHLY RECOMMEND!!! And your friends will crack up with the Scratch-N-Sniff part too.